Slash FT Myles Kennedy & The Conspirators will perform at The Hollywood Palladium on Tuesday, October 16. 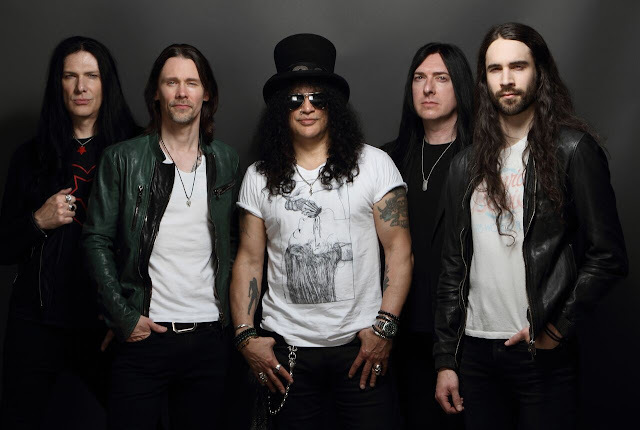 The group is touring off their strongest collective statement to date, "Living The Dream", the full -length album from the group which, in addition to Slash and singer Myles Kenned also includes bassist Todd Kerns, drummer Brent Fitz and rhythm guitar Frank Sidoris. Slash -the iconic, GRAMMY-winning, American rock guitarist, songwriter and film producer --has amassed album sales of over 100 million copies, garnered a GRAMMY Award and seven GRAMMY nominations and was inducted into the Rock and Roll Hall of Fame. Slash landed on the top of the charts with his first solo album, Slash (2010) which featured Ozzy Osbourne, Fergie , Myles Kennedy and more. Shortly after, he formed his current band Slash Ft. Myles Kennedy & The Conspirators and has been touring worldwide and making music for over four years . The group released the critically acclaimed Apocalyptic Love (2012) which stormed the Billboard Top 200 Albums Chart debuting at #4 as the top rock album. Apocalyptic Love has the added distinction of spawning Slash’s first-ever #1 rock radio solo hits: “You’re A Lie” and “Standing In The Sun.” Slash released Nothing Left To Fear (2013) the first-ever motion picture he co-produced from SLASHfiction, his film/TV production company specializing in the horror genre. He is currently working on a new film project. The group unleashed their second album World On Fire to worldwide praise garnering SLASH some of the best critical acclaim of his career. World On Fire achieved over 12, Top Ten chart debuts around the world. LIVING THE DREAM or stream the album here: https://roadrunnerrecords.lnk.to/livingthedream.